Looking to spend your summer vacation roaming around the US inside your RV? Are you worried about your lack of air conditioner or if yours will hold up in the unrelenting heat? Luckily for you, this buying guide will help you find the best RV air conditioner for your next vacation. In doing so, we’ll go over all the essential information about RV air conditioners you’ll need to make a responsible decision about buying one. For instance, we’ll discuss types, what to look for in an RV air conditioner, and other vital knowledge needed to make this process as easy as possible for you. 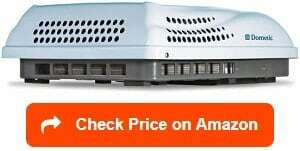 In fact, we’ll even provide you with ten product reviews discussing the top RV air conditioners on the market. 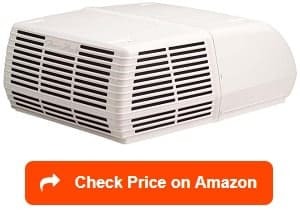 These products reviews will give you some guidance about what you’re supposed to be looking for: it will also expose you to high-end products that could meet your air conditioner needs. Overall, all we’re trying to do is make sure your next RV vacation is as comfortable as possible. After all, nobody wants to spend their summer roaming around inside a big movable sweatbox that you can’t escape. As promised above, this section will provide with those product reviews that will give you some familiarity with the RV air conditioner marketplace. And once you have familiarity, you can start narrowing down precisely what you want out of your new RV air conditioner. Additionally, we’ll also review two RV air conditioner accessories that we find are necessary to get the best performance out of your brand new unit. 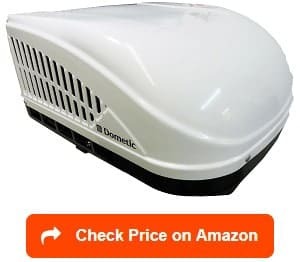 Our first product, the Dometic Brisk Air li Upper Unit, comes from a manufacturer that has been in the RV product making business for a long time. And with this in mind, it’s no surprise we’ll see them multiple times on this list. Now, regarding this particular product, it has a myriad of features that I love about it. For instance, I love that you have a choice about whether you want the standard amount of BTU in 13,500 or a little bit more power with 15,000 option. In my particular case, I’d probably opt for the 15,000 BTU version as I plan to RV in some of the hottest places in the United States: Arizona, Texas, Florida, and Louisiana. So, I’m going to need an RV air conditioner with a little more kick. 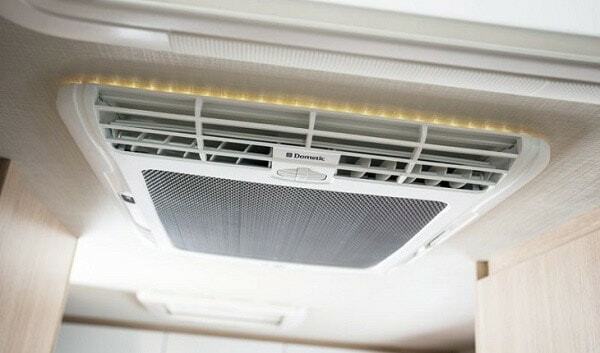 I also like this product is versatile and can work in either a ducted or non-ducted system; therefore, you don’t have to worry about getting this air conditioner and realizing it’s not applicable to your specific RV. Furthermore, Dometic threw in a 2-year warranty that I always like the products to have; it never hurts to have a little protection just in case something goes wrong. After all, accidents do happen and it seems I’m more susceptible to them than most people. All in all, it seems like a high-quality product worthy our consideration, but there was one troubling thing that kept coming up in my research; some customers had these models fail on them around the 1 to 1 1/2 year mark after purchase. And due to this issue, I just don’t see myself investing in this Dometic air conditioner. Comes in with two BTU options, 13,500 and 15,000, and two colors options, polar white and black. The Airxcel Mach 15 is a ducted system RV air conditioner, which has many different features that I adore. For instance, it has a BTU rating of 15,000 that I explained in the previous is a necessity for me, given the areas I plan on RVing. Additionally, the ⅓ hp fan motor is an inclusion that adds a certain level of uniqueness to this product. See, it creates the most significant CFM (cubic feet per minute) rate of airflow at 320 CFM of an RV air conditioner on the market. And if you don’t why that’s important, well, it means it spreads the air faster than any other RV air conditioner in existence. Pretty cool, right? Therefore, with this product, you’re guaranteed results a lot of similar air conditioners can’t touch. Ironically, even with this unique addition, this product doesn’t adventure into the price of what I’d call expensive for an RV air conditioner. Airxcel also found a way to add in the inclusion of electric heat capabilities. Therefore, if year-round RVer, there’s no reason this RV air conditioner shouldn’t be on the top of your list. I mean, it covers every base an RV owner could want and even add in a couple of features we didn’t realize we wanted. But there’s one potential issue about this conditioner that could hold some people back; the noise level was enough a nuisance that several reviews were commenting on how jarring and annoying it was for them. However, given this product’s quality, I couldn’t see myself passing up the opportunity to buy this air conditioner just because the noise was a little bit louder than expected. In fact, as of this moment, this conditioner would be at the top of my list. Equipped with a ⅓ hp fan motor, that creates 320 CFM (cubic feet per minute) of airflow. 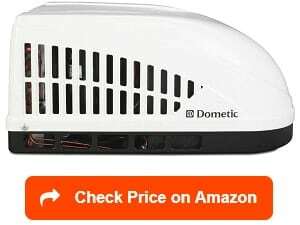 Our second Dometic product, the Dometic Penguin II 410 Amp Low Profile RV Rooftop Air Conditioner, continues to enhance the already pristine reputation this company has; honestly, there’s nothing about this product’s construction that isn’t top notch. With that being said, you shouldn’t be surprised that this air conditioner’s shroud is explicitly designed to extend its long-lasting ability. As someone who appreciates anytime a company tries their hardest to ensure their product ’s longevity, this feature is something I can get behind. Other than the shroud, there’s a couple of other things about this product that I could wholeheartedly endorse. For instance, I, again, like Dometic’s willingness to offer the customers choices about factors such as size and color. Now, high-capacity means 15,000 BTU, so, I opted for that over the 13,500 one for reasons discussed in other reviews. However, I really like the look of the black color on this particular air conditioner; therefore, I’m going to pick the black version this time around. Honestly, picking the color might not seem important, but remember you’re going to be looking at this thing all time; so, why not, choose the version that’s more visually pleasing to you. It just another way Dometic seems to help its customers. More importantly, this product, like the previous one, can work on both ducted and non-ducted systems, which shows Dometic’s willingness to try and make a product every RV owner could use. All in all, another fantastic product from a remarkable company. But, there’s one significant issue, the price ’s the opposite of fantastic. In fact, it’s downright expensive, so, if you’re looking for a bargain buy, it’s best you look elsewhere. As our first strictly non-ducted A/C unit, the Atwood Non-Ducted A/C Unit could be a godsend for any RV owner with a non-ducted system. See, not only does it have 15,000 BTUs, but it also has dual fan motors, which makes it one of the quietest RV air conditioners on the market. Therefore, you’ll never have to worry about this AC driving you crazy with the amount of noise it’s making. Now, this noise issue won’t ever be a problem for me unless it’s borderline migraine-inducing, but it’s still a nice feature to have. Plus, this RV air conditioner also comes with a heat pump that could help you get through any cold winter nights you face on RVing trips. As someone who hates cold weather, this feature could save me from facing one of my worst nightmares. And besides having incredible features, it’s also leading the pack in the area of convenience as well. 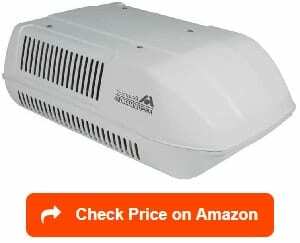 See, numerous Atwood rv air conditioner reviews said installing this product was one of the simplest things they’ve ever encountered with RV equipment. Honestly, an easy installation would benefit more greatly. I won’t lie and tell you I’m a professional by any means. In fact, I struggle with this type of work, so, simple is always better in my particular case. Furthermore, it comes with a remote that gives you access to the air conditioner without actually touching it. These two qualities show Atwood ’s willingness to go the extra mile and make their products as convenient as possible. But Atwood doesn’t have a total heart of gold, the price of this air conditioner is on the large side of the scale, and I couldn’t see me ever being able to afford it. In the end, it doesn’t matter because I don’t need a ducted model for my RV anyway. Our second Airxcel product, the Airxcel Mach 3 Plus, has a lot of the same qualities that the first one did; but it also has some added features that make this air conditioner worth considering in its own right. For example, it’s made with all-copper tubing, and gas-flux brazed joints, which will help ensure this AC unit stays in your life for as long as you need. In fact, I’m reasonably confident these features will keep this unit running in tip-top shape for at least a good five to ten years. I’d also like to point this model can create up 320 CFM of airflow just like the previous Airxcel product, which is a feature that makes this AC unit stand out from all other non-Airxcel competition. I mean, with this CFM rate, your RV will have no issues getting to a comfortable temperature within a matter of minutes. Honestly, I can’t say enough about Airxcel’s ability to cultivate this type of airflow out of their products. Along the same lines, this RV air conditioner is another that comes with heating capabilities, in this case electrical, which remains an incredibly convenient feature. And did I mention, this particular product is one of the cheapest on this entire list? In the end, Airxcel did a fantastic job creating another top-notch product they can be proud of, and customers will love. However, I know, you’re waiting for the other shoe to drop. And unfortunately, it drops in an area where some people find deficiencies intolerable: noise level. See, several customers complained about the noise this AC unit makes. In some cases, they even described it as deafening. Now, I’m not entirely sure this would sway my judgment about this product, but deafening is a harsh term that warrants at least a discussion. The ASA Electronics Advent Air RoofTop AC has a couple of features that make it stand out from the pack of its competitors. One of these features is the plug-in heat strip, which could be a serious lifesaver in certain situations. Honestly, if I was planning on RVing in cold weather climates, there’s no way I would even consider not getting an AC unit without some heating capabilities. And with this heat strip, this air conditioner fills that need. Likewise, the three different fans speeds is another feature that I find very intriguing because I love having complete control. In other words, I’m control freak, so, anything that provides me with that sense is worthy of at least being considered. Now, other than these two features, this product is pretty run of the mill. For example, it has the standard amount of BTUs at 13,500, which is fine but its a little lower than what I’m looking for concerning BTUs. Furthermore, it’s relatively lightweight compared to some of the other monstrous AC units on this list. Given it’s a rooftop air conditioner, I could see how it could be somewhat problematic if it weren’t lightweight. All in all, this product’s an unspectacular option that is worthy of consideration due to a couple of features, and it’s low price. It’s also worth noting that many customers have had issues with the customer support provided by ASA Electronics. As a customer, I would find this unsettling and would think twice before hitting that add to cart button on Amazon with this product. Given it’s a ducted AC unit, the Atwood Ducted AC Unit was a product I was looking forward to reviewing as it hit some of my wishes right off the bat. And as I got further into the research, this air conditioner didn’t disappoint. For example, it comes with a heat pump, which gives me a little protection just in case I end up RVing in colder climates. I doubt I will, but it’s nice to have regardless. Furthermore, it has my desired 15,000 BTUs and claims it can even go higher than that topping at 18,000 BTUs. Honestly, I doubted this claim by Atwood and was proven correct by the customer reviews; however, it doesn’t matter because the initial 15,000 BTUs are certainly enough for my particular RVing adventures. Besides those two qualities, this AC unit also met my preferences in two other areas as well. First, the installation for this particular model is super simple and doesn’t take much or time on the installer’s part. Once I read that, I knew this air conditioner was going to be a contender. Then, the customer reviews started to praise the lack of noise the product made, and that’s when I knew I was hooked. But when I glanced up at the price, I was immediately unhooked. It’s just out of the realm of possibility for me to afford. Then, you add in the factor is over 100 pounds and this AC unit was taken out of consideration for me. Surprise, another Dometic product; and the Dometic Brisk Air II RV AC Complete ND System W/Heat does nothing to soil the reputation this remarkable company has cultivated. If anything, it has only enhanced it with its many different wonderful features. For example, this particular RV air conditioner comes with a complete non-ducted ceiling kit, which means not having to buy additional parts. I utterly loathe purchasing anything that isn’t a complete package, so, this feature is something I’m onboard with entirely. Plus, this AC unit is also extremely lightweight compared to most of its competition on this list. Therefore, it makes sense that so many customer reviews were in awe about how easy the install was compared to past experiences. Honestly, if this product weren’t a non-ducted air conditioner, I would have a hard time finding a reason why I wouldn’t buy it. I mean, it has everything I would want in an AC unit: heat strip, 15,000 BTUs, lightweight, easy installation, etc. All of these are things I’d consider necessities in the RV air conditioner I’d ended up purchasing. It’s a shame this just has a quality that I can’t overlook. It’s also expensive and unbelievable loud, so, that helps dull the disappointment. But I still can’t help feeling a little disappointed this model didn’t mesh with my needs because it’s such a high-quality item. 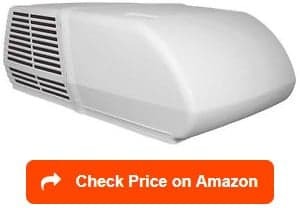 So, if you do need a non-ducted AC unit and can afford to splurge a little, check this product out; I’m confident you won’t regret. The 15,000 BTUs Dometic RV Air Conditioner Heat Pump would be a top-notch product for any RVer that wants something simple and effective. It won’t offer you any crazy features, but it won’t give you any complicated nonsense or issues either. In all honesty, the main thing I liked about this product is I found no reviews with gripes about its performance. Therefore, I feel reasonably confident in concluding this AC unit does everything it claims it can: at an effective and efficient level. It also does all these things at a low noise level that won’t disturb you while you’re sleeping or sitting around inside the RV. With this in mind, it’s easy to see why this RV air conditioner is so well-regarded. And as the name suggests, it comes with a heat pump that makes this model the perfect option for all you year-long RVers. 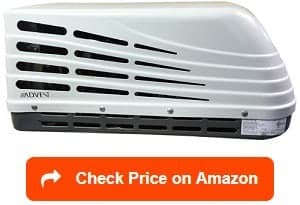 For you guys, it doesn’t get any better than this AC unit, and if you can afford it, a must-have essential. But for me, there are two issues I have with this air conditioner. First, it’s the most expensive product on this entire list. And since I can’t afford some of the other AC units, there’s absolutely no way I’ll be able to pay for this one. Secondly, this air conditioner is incredibly heavy compared to other models. It’s well over a 100 pounds and lugging this up to the top my roof would be a such a pain. Honestly, it might end up being a disaster. So, in the end, this RV air conditioner wouldn’t be a great option for me, but if you can afford and don’t mind its weight, this product is the embodiment of high-quality. Our last RV air conditioner, the Dometic Sanitation Rivet Semi Tube PKG, is a very mundane and rather unspecial product. But what it lacks in unique features, it makes up for in other areas that might appeal to certain RV owners. For instance, this product is a pretty small RV air conditioner, which makes it very lightweight and easier to move than the other models on this list. In fact, it’s pretty close to being the lightest AC unit on this entire list. And as someone who isn’t the strongest man alive, this lack of weight could benefit me when it’s time to move it onto the roof. 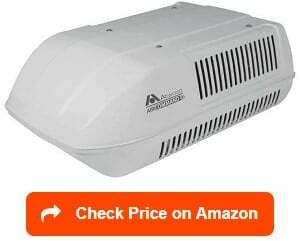 It also helps that several customer reviews praised how easy this air conditioner was to install. As previously mentioned in other reviews, any product that has an easy installation moves up my list immediately. Honestly, there’s nothing that provides me more stress than when companies make their products overly complicated to use. With this air conditioner, this issue doesn’t seem to exist. Furthermore, its inclusion of a heat strip could be incredibly beneficial to year-round RVers. It could help you out if you ever get stuck in the middle of a cold front or just a random cold winter night. 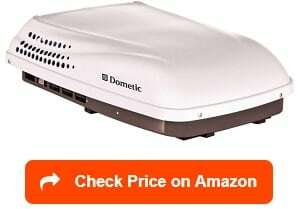 But these positives are counteracted by two significant issues customers seem to have with this Dometic product. First, there were several grumblings in the customer reviews about the shroud being rather flimsy and prone to durability concerns. Secondly, this AC unit has a reputation to operate at unbearable noise levels. With these two issues, I could see why people would look somewhere else; however, I’m going to keep it in contention because it checks a few of my boxes and has a very affordable price. Below, we’ll review two different RV air conditioner covers that will protect your unit from receiving any damage from environmental factors: rain, wind, debris, etc. Our first RV air conditioner cover, the Classic Accessories Brisk II RV Air Conditioner Cover, is a high-quality option for any RV owner looking to add an extra layer of protection on their AC unit. 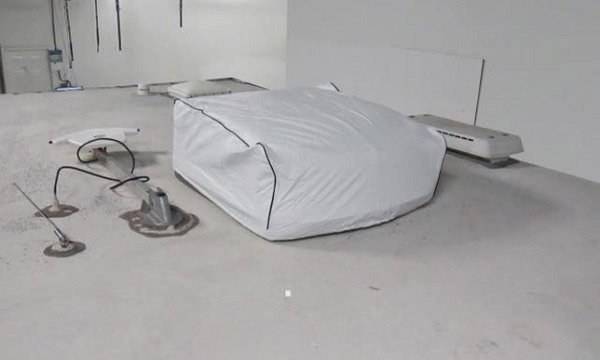 In fact, there isn’t much about this cover that an RV owner would find problematic. 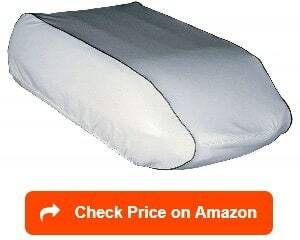 For instance, the waterproof material makes this cover especially effective against preventing environmental hazards from causing severe damage to your AC unit. Plus, this material also makes it super easy to clean; all you have to do is wipe it down. Other than the waterproof material, I also love how easily the cover fits onto most RV air conditioners. It’s a simple slip-on and then you let it do its magic. Plus, this slip-on fit keeps the cover tightly secured around the AC unit. Furthermore, as always, I like the option of choosing the color that fits my personal preferences. In this case, I think the white version looks a bit better than the gray. It also helps that this product is so easy to clean that it being white doesn’t even matter much. And finally, the price is outstanding. For something of this caliber, I was expecting to spend a mini-fortune on something as mundane as an RV air conditioner cover; however, Classic Accessories was nice enough that they kept the price down to a rather measly fee. With this in mind, I might do them a favor and buy myself one or two of these covers. I mean, you can’t do that much better at the price listed. However, I would have to make sure the size was an exact fit to my AC unit. See, several customers were complaining about the cover not fitting their particular AC units. Now, this issue could be created by human error, but it’s still something you should take note of before purchasing. Easy to clean with it being made from vinyl that’s easy to wipe down. As far as RV air conditioner covers go, you can’t get much better than the ADCO RV Air Conditioner Cover. Honestly, it covers all requirements any RV owner would require their cover to have and does so in an efficient/effective manner. Therefore, if you’re a little worried about your AC unit getting damage by those pesky UV rays, simply pop this product on top of it and let your worries flutter away. See, with its heavy-duty vinyl material, this cover should have no issues protecting your AC unit from whatever environmental hazards may come your way. In fact, I love this cover so much I might even entertain getting the 4-pack. After all, my clumsiness is bound to get one of them ripped or torn. Therefore, with the 4-pack, I’ll always have a backup of this fantastic product. Furthermore, I also thoroughly enjoy the cover’s ability to reduce cold drafts from coming into the RV through the AC unit. And even with discussing all these incredible benefits, I didn’t even mention the best part yet, the price on this cover is very affordable. In the end, there’s nothing about this product that you can even remotely complain about; it has everything you could ever want in a cover. In all seriousness, I couldn’t find one legit complaint about this cover, and that’s never happened before with a product I’ve reviewed. 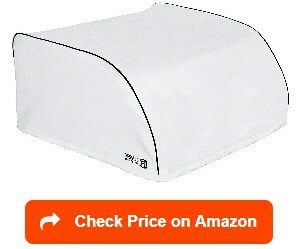 So if you’re looking for an RV air conditioner cover, go onto Amazon and immediately put this in your cart. I promise you won’t be disappointed. Regardless of the product, there are always factors that will have a significant impact on your decision. In this section, we’ll discuss those essential factors that will help you decide which RV air conditioner is the right one for your particular needs. In the RV air conditioner world, there are two types: ducted and non-ducted. As you would expect, both have situations where they would be more effective and useful than the other. Your job is to decide which is better for your RV? For example, if you have a bigger RV, you’re going to want ducted version because these air conditioners allow you to control the temperatures in multiple rooms inside your RV. See, these ducted air conditioners work by passing air through a “duct system” that usually pipes in your RV’s floor, walls, or ceiling. On the other hand, if you have a smaller camper, there’s no reason to worry about controlling temperatures in multiple rooms and non-ducted air conditioner should work fine. In fact, these models don’t even work with the piping, but instead, blow air out the bottom of the air conditioner itself. Therefore, you can see how these models would be more appropriate for a smaller space like a camper. It just wouldn’t make logical sense or financial sense to buy a ducted air conditioner for this type of motorhome. In the end, it’s all about being realistic about what your RV needs and catering your search around those requirements. An RV air conditioner’s BTU refers to the amount of energy your RV air conditioner uses per hour. In other words, this scale will help you determine what the best RV air conditioner is for your RV. In fact, if you’re going to find your perfect RV air conditioner, you better know the exact right amount of BTU’s it will need. For instance, if you get one that has a higher BTU than you need, then it will end up costing you more at purchase, and you’ll feel like you got swindled. And it will end up costing you more in the long term as well because regardless of the air conditioner you get it has to run for a significant amount of time for desired results. And if you don’t need that powerful of an RV air conditioner, you’re just wasting energy. Likewise, if you buy an AC that doesn’t have enough power, it could end up costing you money because it has to run longer. As you can see, this factor is a very delicate issue that needs some serious consideration. Therefore, it’s essential you the mind the 13,500 BTU line. What do I mean by this? Well, the standard RV air conditioner has a BTU of 13,500. So, if you’re traveling to a hotter place and anticipate using the AC a lot, get an air conditioner with a higher BTU than 13,500. And if you plan on using the AC sparingly, then you should look for one with a lower BTU than 13,500. The one way to make sure a product’s high-quality is by looking through the experiences other customers had with it. In other words, customer reviews are the best source you can explore when researching a product. With this in mind, it’s essential you don’t just trust the product descriptions given to you by the manufacturer. Often, these companies will claim a product can do something it can’t and RV air conditioner manufacturers are no different. Therefore, don’t fall victim to this trap. Instead, rigorously dive into those customers reviews until you have a comfortable consensus about the quality of the product. Or if you don’t want to do that, you can trust I will and believe in the products I recommend in this article. And the last factor you must consider is whether or not you want to use your AC unit year-round. See, some RV air conditioners can provide both heat and cooling with the inclusion of a heat pump. Now, this factor is mostly for full-time RVers who like traveling in both the winter and summer and needs something to help fight against those cold winter nights. I’d honestly opt against getting a heat pump included as it going to cost extra and I won’t need it because I only RV in the summer. However, I could see how this could be a godsend for someone who likes RVing to places like Wyoming or Montana during the winter months. In the end, it’s just another reason to sit down and discuss what you truly want out of both your new RV air conditioner and your overall RVing experience. In this FAQ section, we’ll try our best to answer any remaining concerns that might affect your decision about buying an RV air conditioner. In doing so, we hope we’ll make you informed enough about these products, so, that you can make a responsible decision about buying one. What is an RV air conditioner? How does it work? You might be surprised to learn that RV air systems haven’t changed much since the RV was first brought into creation. See, the air conditioner runs on something called AC power, which comes from the 120-volt socket that is plugged into a generator or shore power. However, these gas generators can be quite expensive. So, RV owners have looked to other sources of power for their air systems. 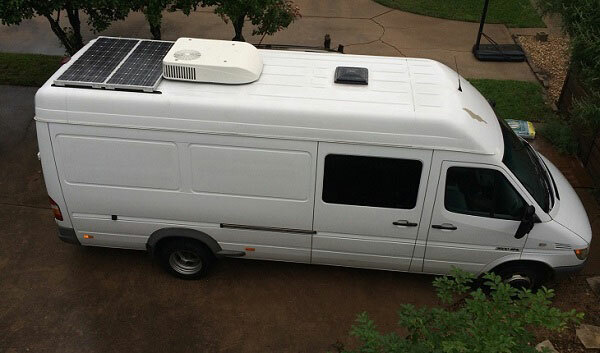 Many have come to start using solar energy that powers their air systems through solar panels attached on their RVs. Regarding how the actual air conditioner works, RV’s usually have air conditioner vents on the roof (nine times out of 10). This location allows the air conditioner to offer incredible cooling power and makes sure it can even work during those long drives. Interestingly, an RV air conditioner work a lot similar to have a refrigerator would; see, rather than cooling down the room, as you might expect, it merely removes the heat and ushers it outside. Seems pretty simple, right? Well, it is, and I could go into excruciating detail about how each part works with the other to create this cooling effect. But honestly, it isn’t that exciting, so, remember an RV air conditioner has one job: to make sure those hot summer days aren’t unbearable. And if you have a high-quality air conditioner like the ones in our product review section, these hot summer days shouldn’t cause you any problems. In fact, you might find yourself looking forward to them. Why do you need an RV air conditioner? Let’s be honest; the best time to RV is in the summer. After all, there’s just so much free time and things to see during those summer months. However, an RV in the summer months can often feel like a giant sweatbox. And without an RV air conditioner, I honestly don’t see how a person, nevermind a family, would survive. Therefore, it’s essential you get a high-quality air conditioner for your RV or your RV trips will be intensely unpleasant for everyone involved. Now, keeping everyone from going insane isn’t the only reason getting an RV air conditioner is a must for any RV owner. For example, some of you might be thinking you can use the air conditioner you use at home, but these models can’t handle the vibrations you’ll encounter driving. 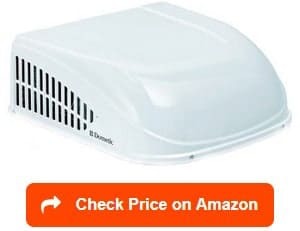 I know, it stinks because it would be much cheaper, but in the long run, you’ll be saving money because if the air conditioner breaks, now you have to buy two: a replacement one for your home, and one for your RV. Additionally, an RV air conditioner will help keep the air clean aboard your RV. In fact, the higher the quality of your AC unit, the cleaner your RV’s air will be, which means a lot less dust and other allergens that could trigger allergies. In the end, you need an RV air conditioner to ensure your RVing experience isn’t a hellish nightmare during those summer months. Plus, there’s a reason AC units have been included with RV’s since their creation. What are types of RV air conditioners? There are two main types of RV air conditioners: non-ducted units and ducted units. As you might expect, both of these differ in ways that could benefit one RV owner differently from another. 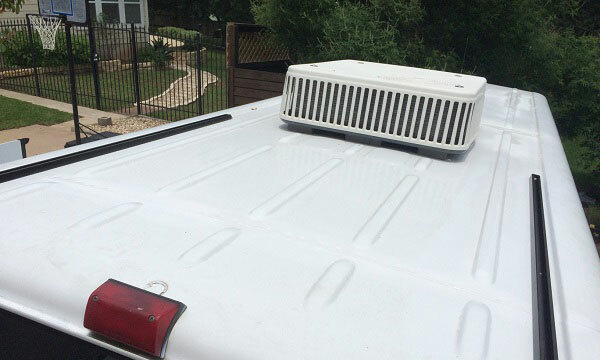 The simplest type of RV air conditioner, non-ducted units, can installed through a hole cut in the RV’s roof, but often designed to fit into pre-existing roof vents. These units consist of a compressor, condenser, and blower that are all packaged together in an aerodynamic body that sits on the roof of the RV. These function by having air blow out of the unit itself. Then, the air usually gets sent through vents that either opened or closed. These vents will direct the air to where it’s needed, whether it’d be forward or backward, within the RV. In other words, if you have a smaller camper that doesn’t need to distribute air over long spaces, the non-ducted units are what you should be looking at rather than ducted ones. It just wouldn’t make financial or logical sense for a camper owner to get a ducted air conditioner. As you might expect, ducted units are little more complicated than the basic non-ducted ones. Now, ducted units have the same part that bolts onto the roof as the non-ducted versions. However, they don’t have the control unit on the inside of the RV. Instead, these air conditioners control the temperature by passing air through a duct system that usually pipes through the ceiling, floor, or walls. It’s also essential to note that you can have several of these air conditioners installed throughout your RV. In doing so, these systems allow you to control the temperature in multiple rooms at once with a centralized control panel. What are good RV AC brands? As you’ve seen from our product review section, there are four brands we consider above the rest in the RV air conditioner marketplace: Dometic, Atwood, Airxcel, and ASA Electronics. And I thought a little background information on each company, could help you feel more comfortable about making a decision. Now, sold under the previous mentioned Dometic, Atwood was founded in 1909 “by brothers James and Seth Atwood.” And ever since then, this company has been providing the world with fabulous products that have stood the test of time. Airxcel is a “holding company of quality brands, who is a committed partner to our employees, customers, suppliers, financial partners and communities in which we operate.” And in being so, they make sure to provide their customer with the best product possible no matter the circumstances. What size RV AC do i need? Well, before deciding on what size RV air conditioner you need, you must understand how these products are sized in the first place. 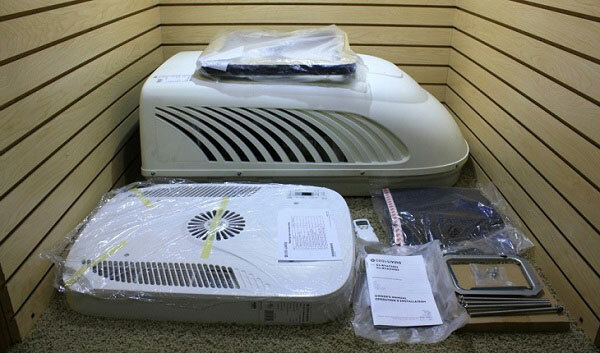 Within the RV air conditioner world, the size all depends on something called BTU or British Thermal Units. The BTU or British Thermal Units refer to the amount of energy your RV air conditioner uses per hour. Therefore, it’s essential you know exactly how much BTU your RV requires to keep it nice and cool. After all, you don’t want to buy an RV air conditioner that is either too weak or too powerful. Instead, you want a product that is just right for your RV. Now, standard RV air conditioners are going to be around 13,500 BTU and this a perfect place to start calculating how much BTU your particular RV needs. For instance, if you’re going to be vacationing in hotter climates, you should look for an RV air conditioner with a higher BTU than 13,500. On the other hand, if you’re going to be vacationing in cold climates or plan on using the AC sparingly, you should look for something will a lower BTU. And if you do opt for an AC with less BTU, it’s essential to note that you’ll be saving yourself some money. For me, I’d personally opt for an RV air conditioner with a BTU above 13,500 because I’m taking trips to place like Arizona and I don’t want to die of heat exhaustion. Therefore, it’s all about determining how much you’re going to use the air conditioner and then picking the corresponding model with the right amount of BTUs. In the end, choosing the right size RV air conditioner isn’t a complicated process, so, don’t overthink it. How to charge RV AC? Once you get an RV air conditioner, there will come the point where it’ll need to recharge. See, these products run on refrigerant, which maximizes the efficiency of the air conditioner. Now, the refrigerant can be filled to a necessary level, but if it does run out entirely, you’ll need to recharge the air conditioner. Lower the power supply to the AC unit before doing anything else. You can do this by accessing the electrical breaker in the panel box. Make sure you bought the right refrigerant. The instructions about which refrigerant to obtain should be on the side of the RV air conditioner unit. It’s time to lift the lid of the air conditioner. You should use a socket to remove the shroud screws around the lid to ensure this process goes as smoothly as possible. Then, lift the lid straight up to make sure you don’t damage any parts inside the unit. Once you’ve lifted the lid, you should check the refrigerant gauge. Then, unscrew the port with a wrench and begin to add in the necessary amount of refrigerant. Now, it’s essential you add in the refrigerant slowly. As you’re during this, make sure you make a note of the difference in temperature between the air within the unit and the RV several times. After the necessary amount of refrigerant is added, the temperature difference between the air in the AC unit and the RV should be about 20 degrees different. Restore the power to the air conditioner and monitor the temperature in your RV to ensure the air conditioner has been charged effectively. How to install RV AC? It depends on the model and the type of RV you have, but in general, installing an RV air conditioner won’t be an overly burdensome process. I mean, you’ve probably installed other RV equipment before, and this process won’t be much different. Turn off the power. In other words, unplug the unit from the power source and then flip the corresponding switch on the breaker box. This will make sure you won’t get shocked to death when you’re installing your new air conditioner. Determine where the best spot for your new air conditioner. Make sure there’s no lights or anything else obstructing the location. You’ll need to pick a place that will be strong enough to support the unit reasonably. Also, make sure there are at least 8 inches between that spot and the edge of the roof. It’s time to cut a hole in your roof. Now, this will be the most challenging part of this whole process, so be careful and measure precisely. You must also make sure the hole is big enough to fit the connections between the ceiling part of the air conditioner and the roof part of the air conditioner. Lastly, mark locations of where the bolts will go in as well. Mount the roof part of the air conditioner over the hole. Then, screw the unit in with the mounting bolts at the locations you’ve marked. Next, inside the RV, install the bolts that will hold the ceiling part of the air conditioner in place. Finally, mount and secure the ceiling portion. Add sealant to the points on the roof where the air conditioner comes in contact with metal for extra stability. Wire the ceiling unit to the proper locations that will be determined by each wire’s color. In other words, match the wires to their corresponding wires that share the same color. Plug the ceiling unit into the roof unit. Turn the power supply back on, and your air conditioner should be ready to start making your RV a nice cool and relaxing place. How to clean an RV AC? As anyone with RV air conditioner knows, these things can get downright gross, and they need regular cleanings to ensure they operate at peak performance. However, it isn’t enough to only clean the filter; a lot more is required for your RV air conditioner to keep working at an efficient and acceptable rate. For instance, a good thorough every other season cleaning of your RV air conditioner’s condenser and evaporator will go a long way towards making sure it stays working for a long time. Unplug the AC from the power source. You can accomplish this by either disconnecting your RV from the shore power or turning off the breaker. Once you’ve turned off the power source, it’s time to get up on that roof. Now, if your RV’s roof isn’t meant to be walked on, make sure you put down some plywood that you can safely walk on. After you’re safely walking around the roof, remove the nuts and bolts keeping the AC shroud in place. Cover all the electrical connections with plastic bags to help protect them from moisture. Then, apply your chosen cleaner (most kitchen spray cleaners will do the job) to coils and let it soak for a good 15 to 20 minutes. After letting it soak, use a garden hose to flush out any loose debris. Depending on how bad you let your coils get, this may take several attempts to get rid of all the dust and other debris. Lets the coils dry out for a few hours. You can even use a vacuum or fan to help speed up the process, but make sure the coils are completely dry before putting the AC shroud back on and turning on the power source. How to maintain an RV AC? There’s no checklist for maintaining your RV AC. Honestly, keeping your RV’s AC in good shape really comes from you being aware of its condition and giving it a proper cleaning once every other season. Now, in between cleanings, it’s essential you’re mindful of things like rain storms, wind, debris, or UV rays causing damage to the air conditioner. It’s also a smart idea to regularly check your unit for leaks and water intrusion. In doing so, you’re ensuring you don’t get surprised by some issue that might drastically effective your RV experience. It’s little things like this that make sure your RV air conditioner is in your life for years to come. If you want further tips regarding maintaining your RV’s AC unit, this article here has a bunch of tips about that very topic! All in all, you must find the best RV air conditioner to ensure your RV vacation doesn’t become a miserable experience. Honestly, there’s nothing worse than being stuck in a confined box of unrelenting heat for hours upon hours. With this in mind, there’s no reason you shouldn’t make sure your RV air conditioner is up to snuff. And if it isn’t, please make sure you at least consider the options we presented in our product review section. I mean, every last one of them would be a suitable air conditioner to cover all of your particular needs. In the end, it’s all about finding the best one that will check every box you’re looking for in your next RV air conditioner! We would like to thank you for reading this article. Find out more about how to choose the best RV thermostats, best RV roof vent fans, best RV vacuums and best RV grills with our reviews and ratings. Furthermore, please take a look at the best RV dehumidifiers, best 12 volt refrigerators, best RV washer dryer combo and best RV heaters, to buy the best one for your RV appliances, heating, ventilation and air conditioning.